Impeccably cared for top floor, end unit, cute as a button contemporary condo in exceptional boutique building. PERFECT Cap Hill location. All BRAND NEW carpet and paint! Walk to Trader Joe's, Governors Park, Bones and more! 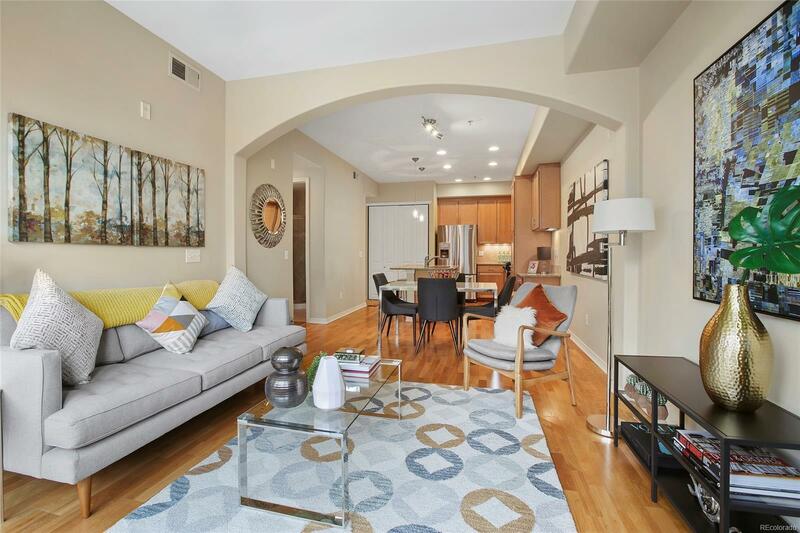 Amazing natural light, 9' high ceilings, hardwoods throughout liv rm., din. rm, kitchen. Beautiful architectural details. Secure building. Spacious open kitchen has SS appliances, gas range, solid surface counters, like new cabinetry, island/bar eating/sitting area, bright backsplash and under cabinet lighting, and dining room adjacent. Living room has high ceilings, huge windows, private covered balcony, fireplace. Master BR has 5 piece en suite bath and abundant natural light. 2nd bedroom has its own hall 3/4 bath. Laundry is private in spacious residence hall closet, side by side. Convenient on site gym & biz center. Parking is deeded, heated, secure, underground/elevator accessed, with heated driveway/ramp, AND private secure storage locker in garage as well.